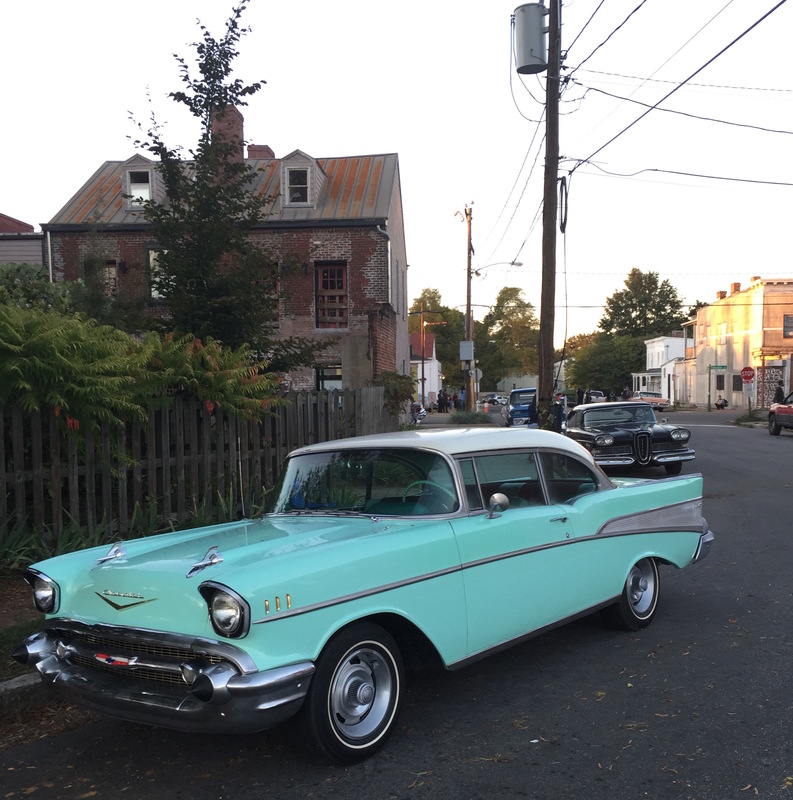 Filming for the Loving movie has brought a wonderful array of cars to area around Venable Street. Shucks, John…you didn’t catch my granddaddy’s turquoise and white 1965 Chevy pick-up! Oh well, there are definitely some great vintage vehicles being used in the movie, from the 40s to the 60s. Bummer, John! You did get some good ones though. @John- I just learned why you couldn’t get to the truck…they used it in the main shot. Woohoo! My family is so excited. @Alexander- Yep, they’re planning on filming in CH for about a week. I encourage anyone who doesn’t know much about Mildred & Richard Loving to look them up online. Tapes of interviews with them, their ACLU attorneys and last living child are available online, as well as articles about them. Quiet heroes. My first car was that 57 Chevy, only pepto bismal pink!!! Cruising at its finest??? What era is this movie supposed to take place in? I ask because I am a car fanatic and also check movies for continuity accuracy. Some of these cars have modifications such as wheels that are too modern, license plates that say antique, and older cars that look too pristine lacking wear, dirt, and aging. And that doesn’t even include period street lighting or signs. @11 – if it’s in public you can take pictures. I’d have kept shooting them and if they interfered with me would have bee happy to sue a movie studio. My son was told by a crew member that he could not take pictures. He, of course, told the crew member that taking pictures on a public street was not illegal and that there were plenty of cops around if he wanted to check that out with them. The crew member backed off….so, go take your pictures. @Eric- The movie covers the 40s, when Mildred and Richard were young, through their Supreme Court unanimous victory in the later 60s. If a license plate appears to be in sight of filming, a period-appropriate plate is added. The numerous vehicles being used in this independently-made film (not on a big studio budget) are rented from locals. Some are in better condition than others, but I can tell you that I wouldn’t have allowed my grandfather’s truck in the movie if they’d wanted to dirty it or rough it up. I do hope you’ll enjoy the historic and inspiring story of the Lovings, whether a wheel may or may not meet historically-accurate standards. The heart, respect and love going into this movie should be evident in the final product. Lastly, I’ve been asked not to take photos of my own vehicle while it’s on the set and am fine with it. The experience of watching is plenty exciting for me. I am with Ann about taking pictures from the public street. There is nothing they can do about it except rope off the area far enough away from prying eyes. As far as small independent versus big budget Hollywood… even they get things wrong. Take the big budget 2001 movie “Pearl Harbor” by Michael Bay that cost $140-million to make. The automobiles were all too clean and new looking, even older everyday drivers. One used quite a bit in scenes at the start of the invasion had wide radial tires on it rather than period correct skinny 6-inch wide tires. Too me that stuck out like a sore thumb. Like the 1957 Surf Green Chevy above that has Rally Wheels not introduced until 1967 and then not swapped out much until the 1970s or later. Or like in car chases where a wheel cover flies off in one scene and it is back on in another that follows. These people have the budget to hire people to check continuity not only between scenes but also for period correct sets. I can understand independent budgets but if it was my film and/or studio, I would try to make a good impression with others in making an effort to get it right and be noticed for doing so.